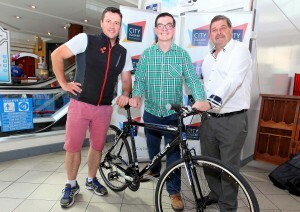 City Square is a delighted to sponsor this years Tour De Munster in aid of Down Syndrome. 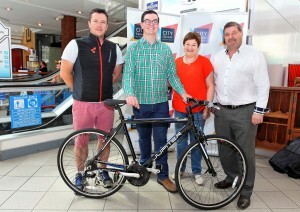 To celebrate we teamed up with Spokes Cycles in Waterford to give away a bike worth €350. All people had to do is guess the number of spokes on the bike display. The correct answer was 646 as guessed by the winner Craig Smith who is pictured here with Liam Lowe, proprietor of Spokes Cycles and Alan Weston, Manager, City Square Shopping Centre.